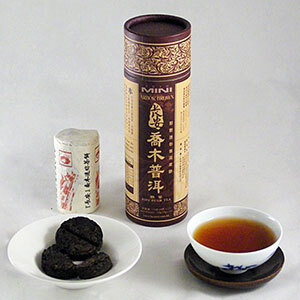 Using the same leaves as the Chang-an loose leaf Ripe Pu-erh, the Mini Chang-an Lucky Coins are made for convenient brewing. The round cylinder contains twelve 10g baby cakes that have a creased diameter so they can be easily broken into two 5g pieces if desired. No need for breaking up a tea cake or measuring the amount of tea leaves, the Mini Lucky Coins are a perfect size for brewing tea in the office or away from home. Made from old arbor trees, this tea is smooth and rich and has a sweet after taste. Another proud product of Master Vesper Chan, it is one of the few high quality ripe Pu-erhs in the industry. After tasting a sampler of teas, I chose this one for it's smooth and subtle character. The tea has lovely subtle aromas and a smooth body with each steeping. I especially like the scent, with a touch of seaside air with the wood and leaf aromas. I enjoyed this tea but found it to be overly dark and pungent on its own. I like mixing it with other less dark sho pu-erh's (like God Medal 2006 and Enchantment of Ancient trees to round out the flavor.